What Happened to Virtual Dissections? Many of us may have used virtual dissection platforms to supplement classroom activities or provide make-up work for students who missed lab days. Unfortunately, many of the platforms for virtual dissections were created using flash animation. Web browsers no longer support flash, mainly because they create security risks. Viruses and malware can be delivered through flash programs, and you don’t even need to click on the animation to be infected. This resulted in many well-known browsers, like Firefox and Chrome to no longer serve flash animations. You can sometimes get around this by installing third party addons that will display those animations, but those types of work-arounds may not be sustainable. I’m slowly been building pages that work like virtual labs, where students can click through images and see photos and descriptions. I’m not great with HTML 5, but I do know that you can build animations with it, such as those seen on 3D Toad. The images on that page are nice, but seem a little small and not always clear. 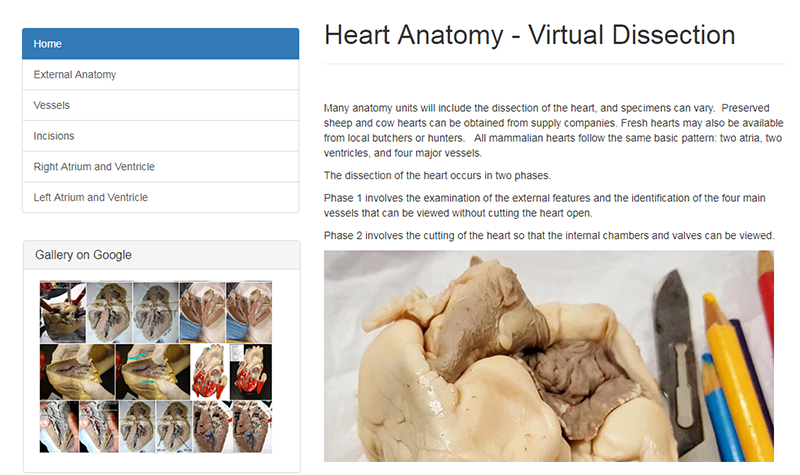 My newest project uses simple HTML to create a click-through menu of the heart with descriptions, described as the “Heart Virtual Dissection.” Hopefully, I’ll be adding more of these types of pages for other dissections and including more clickable or interactive components.